Mega Sale! 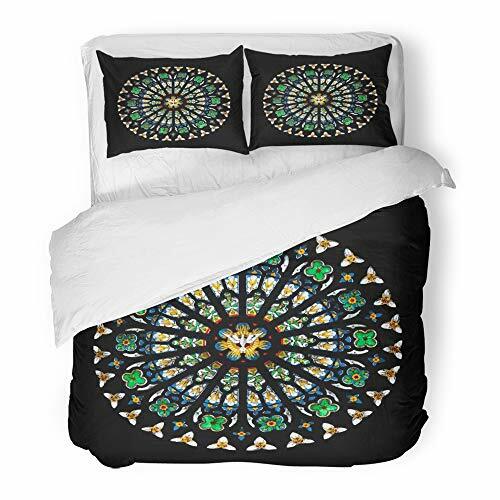 Save 26% on the Emvency Bedding Duvet Cover Set Twin (1 Duvet Cover + 1 Pillowcase) Gothic Rose Stained Glass Church Window Round Cathedral Architecture Mosaic Stain Hotel Quality Wrinkle and Stain Resistant by Emvency at Epfup. Hurry! Limited time offer. Offer valid only while supplies last. Twin: 1 piece Duvet Cover 68"x86"(172x218cm) ,1 piece Pillowcase20"x30"(51x76cm). High quality Duvet Cover. Simply slip it over your comforter, duvet insert, or alternative down comforter sets. easy to remove and wash,the fabric is exceptionally soft and easy to iron. The material is processed to protect against any shrinkage after washing; Fade and stain resistant for years to lasts. Fabulous selection of vibrant dyed yarn solid colors will make your bedroom look like a celebrity home.